Perhaps you are not a super football fan like me, but now is the Euro Cup 2012 and it means that now is the time for football! Think about that in a positive way considering how to improve your German. You can find in the city so many places where you can watch a match, in German of course. All the newspapers talk about the prevoius and the next match, so you already know the context and that could help you to understand the text. 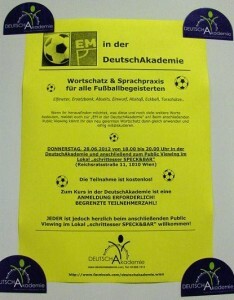 But if you are a real football fan there is an special offer for you ,,EM in der DeutschAkademie: Wortschatz & Sprachpraxis für alle FuÎ²ballbegeistertenâ€™â€™. This event will take place today from 18:00 to 20:00 at ,,schrittesser SPECK&BARâ€ (ReichsratsstraÎ²e 11, 1010 Vienna). There you can learn and practice all what you need! This entry was posted in Mein Deutschkurs on 28. June 2012 by Nuria. Why did I choose DeutschAkademie in Vienna? With one course you have half of a level of a Common European Framework of Reference (CEFR) for languages. It means that with 2 month you can reach one compleate CEFR level. That is a really short period of time. 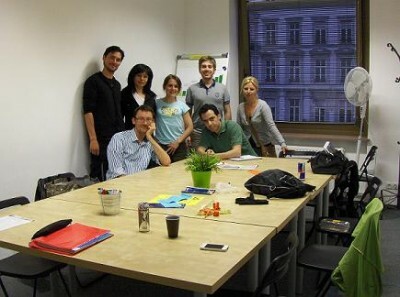 Another good point of DeutschAkademie is the price: 250 euro/course in Vienna, one of the cheapest ones in Vienna. And the last interesting point is the location: right opposite the Opera, right in the city center. This entry was posted in Mein Deutschkurs on 26. June 2012 by Nuria. Heute schreibe ich über meine Kollegen. Wir sind 9 Studenten. Wir kommen aus Bulgarien (2 Studenten), Frankreich, Griechenland, dem Iran, Lithuania, Polen, Rumänien und Spanien. Sie arbeiten oder studieren in Wien, aber alle wollen Deutsch lernen. Unsere Lehrer ist Alex Riha, er kommt aus Östereich, natürlich! Jemand kennt am bisschen von der österreichischen Kultur: der Tanz, die Gastronomie, das Essen, die Kleidung, die Oper… Wir sprechen Deutsch im Kurs, aber wir braucen noch das Wörterbuch. Es gibt jüngere und ältere Leute. Das ist kein Problem, weil wir viel Spaß zusammen haben. Je mehr Nationalitäten im Kurs, desto besser! Man kann in das Bild meine Kollegen vom Deutschakademie sehen. This entry was posted in Mein Deutschkurs on 25. June 2012 by Nuria. Hello again, I will write not only in German! During these days I will let you know about whatâ€™s going on in Vienna, some interesting information and tips to try to make easier the process of learning German. As I said on the previous blog, today I’m going to talk about Donauinselfest. There is an island between the Danube river and the parallel excavated channel Neue Donau. You can reach it by different public transports, in my case I choosed metro U6. Year after year, till the 29th edition there is the Donauinselfest in Vienna. 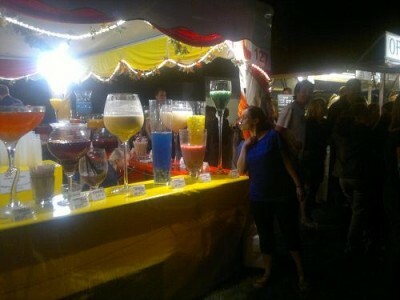 On this year you could enjoy this music festival from 22nd till 24th of June 2012. Itâ€™s the biggest Open Air Festival with free entrnce Europe. Just some numbers to give you an idea: festival area length of 4.5 km with 12 different open-air stages and in 20 tented areas around the Danube island. Still it doesnâ€™t look interesting enough? Itâ€™s something more than just a music festival. You can do a lot of things during the day and the night. Family activities, workshops, games for kids, karaoke, eat and dring, take a bath at the Danube river, lie on the grass, sport and adventure activities and of course listen to the music on the different stages. This entry was posted in Mein Deutschkurs on 24. June 2012 by Nuria. Ich bin 28 Jahre alt. – Wie lange bist du schon in Wien? Ich bin seit Oktober in Wien. – Warum bist du nach Wien gekommen? Ich werde ein Master in Wien machen. 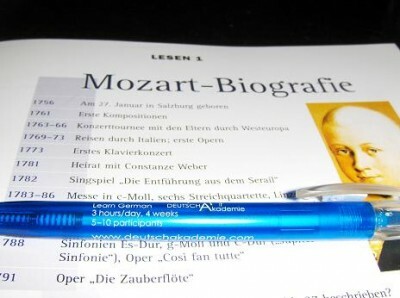 Jetzt mache ich der B1.2 Kurs aber ich brauche das B2.2 Niveau. – Was hast du voher gemacht? Ich habe Biologie und Lebensmitteltechnik studiert. Ich gehe nach Donauinselfest zum Beispiel. Ich spreche über das Fest am nächste Blog. Du kannst mich auf dem Bild sehen. Was möchtest du trinken? This entry was posted in Mein Deutschkurs on 23. June 2012 by Nuria.